ETC in their messages inform that the mankind’ life in solar system goes by cycles. Thus transition from a planet on a planet occurs through the parallel worlds. Complete life cycle of humanity on Earth consists of two cycles – the cycle of Consciousness and the cycle of Correction. Each cycle of life takes place on different of parallel levels of the material world. The cycle of Consciousness in which today we live and make decisions, passes at the lowest level of the material world - a level of the Crystal structures. Our next cycle of life – the cycle of Correction will take place at the Highest level. This cycle will also pass on Earth, i.e. in the same harmony. In the cycle of Correction on the Highest level our body will be holographic. In the cycle of Consciousness occurs a consciousness self-improvement, we make decisions ourselves according to the commanders. In the cycle of Correction by fire will happen forced adjustment of consciousness in accordance with the Universe laws. The purpose of the cycle of Correction – the final correction. It is hell and paradise according to the Holy Scriptures. Immediately after the Last Judgment and the General Resurrection at the Highest level will begin a new cycle of life – the cycle of Correction. There will be only two categories – hell and paradise. In the cycle of Correction everyone will be responsible for his actions made today. All our consciousness imperfections will be burned out by fire. The criteria of hell and paradise are the commandments. Our right and wrong decisions correspond to right-and left-hand turns of consciousness at the Information level and are fixed in our individual cell, as the prints. In hell by fire will be burned out the imperfections of body - areas corresponding to incorrect accepted decisions, meaning left-hand turns of consciousness. Only the right-hand turns of consciousness corresponding to right decisions will remained. Analogue of Hell on the Earth is spontaneous human combustion (SHC). One of the common features of SHC is the following. The whole body or part of it is burned in extra high temperature of 1700°C without external source of fire and it is impossible to stop it. It is amazing that surrounding objects – chairs, floor and part of bodies, sometimes feet with stockings remained comparatively undamaged, but bones of human are turned into ash. Hell is a multilayered structure. At the lowest layers of hell the temperature of fire will be the most high and these layers are most terrible. The strongest imperfections of consciousness will be burned out layer by layer during millions of years. This way by forced correction will be destroyed imperfections led people to crimes. Killers, thieves and people who made other crimes will go through incredible sufferings, but nobody could help them. At this moment people will understand their mistakes but it will be too late. Their sufferings will be the payment for tears and crippled destinies of many people which they made. From layer to a layer will be burnt out areas corresponding to imperfections of consciousness. If individual committed numerous crimes and has too many left-handed turns of consciousness revealing his imperfections then a huge areas of his body will be burned out. Such individual will not any more be a human being, the representative of the fourth level of consciousness. In consciousness of such individual will happen the inverse transformations and gradually from layer to layer he will be transformed into an animal, a plant or a stone, i.e. to objects of lower levels the consciousnesses corresponding to organic or inorganic nature. Such individual is the future spiritual invalid. In childhood in fairy tales we read that an evil, greedy stubborn or stupid people transformed to a stone or animal. One of them is about sister Alenushka and her brother Ivanushka who did not listen to her and became a little goat. Now we understand that it is not a fantasy, but a warning to us. Is it possible to help the future spiritual invalid? It appears that such individual can help only by himself. Charity to the needy, preferably anonymous, can expiate evil deeds which individual made during today's life in the cycle of Consciousness. This makes his cycle of Correction easier. Certainly, one should deeply realize a criminal conduct and never repeat mistakes. The basis of human behavior in our cycle of life today: to treat one's neighbor as oneself. From layer to layer the fire will become weaker and less imperfections will be burned out. In the paradise people who helped others and made many good deals will enjoy the beauty of harmony. The cycle of Correction will be very long during millions of years. That’s because the layer removed by one step of fire will have certain depth. So, do good today! ETC show incredible duration of the cycle of Correction by long beaks of birds of the Nazca Lines – for example Flamingo with zig-zag neck, humming-bird and others. The Transition to the next cycle of life humanity will make through united consciousness. After the Transition to the next cycle – cycle of Correction – consciousness of all civilization remain united. Therefore, all the suffering experienced by everyone on Earth will feel all other people. When the cycle of Consciousness of mankind on a planet comes to an end, humanity has to make the Transition to the Highest level of the material worlds in the cycle of Correction. With the end of the cycle of Correction the complete cycle of mankind’ life on Earth will be also finished. After termination the complete cycle of humanity on Earth will happen the Transition to the harmony of the next planet Venus, closer to Sun. In Solar system each time after termination of Correction cycle humanity will make transenergy descent to the next planet with higher frequency of rotation closer to Sun for continuation of consciousness perfection at higher level of the Crystal Structures. In planetary system transition from a planet to a planet occurs through parallel worlds. Civilization of Earth in the nearest time should make the Transition in the following cycle of a life – the Correction cycle through the parallel worlds. After the cycle of Correction mankind will make transenergy descent to Venus. On Venus the mankind will pass a new complete cycle of a life which also will contain the cycle of Consciousness and the cycle of Correction. From Venus there will be transenergy descent through the parallel worlds on Mercury. Mercury is last planet on which consciousness in Solar system will be improved. Extraterrestrial civilizations through crop circles pictograms inform, that after Mercury life of mankind will proceed in other planetary system of different star, not the Sun with six planets. Thus, transitions from cycle to cycle are transitions through levels of parallel worlds. A jump from the lowest level to the top, the Highest level of the material worlds, and then how from a hill on sledge, from top level through intermediate – on bottom – level of Crystal structures. 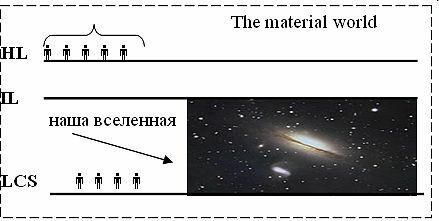 Three Transitions of mankind in solar system on Earth, Venus and Merсury extraterrestrial civilizations represented in their pictograms. Thus, in the crop circle on August, 4th 2003 Wiltshire, England three Transitions of mankind are shown by three Swallows. The smallest Swallow corresponds to our Transition on the Earth. The middle Swallow represents mankind’ Transition on Venus, and the greatest – on Mercury. So, ETC inform that the consciousness of mankind at Transitions on Earth, Venus and Mercury will be more and more perfect. The Nazka Line pictogram the Monkey shows three Transitions of mankind in solar system on Earth, Venus and Mercury in the form of three triangles. From planet to planet consciousness of humanity will be improved more and more. Humanity will have less imperfections, therefore the Correction cycle will be shorter and shorter. Our first cycle of Correction in harmony of Earth will be the most long. It is shown by the long line marked by red arrow. It crosses the oscillations and closes the first, the largest triangle. The Correction cycle on Venus will be significantly shorter. It is shown by a line marked by a blue arrow. The line is the basis of the second medium triangle and proceeds further, crosses the oscillations and goes up to almost right angle of the third triangle. The cycle Correction on Mercury will be the shortest. It is shown by a line designated by a green arrow, a closing side of the third, smallest triangle. 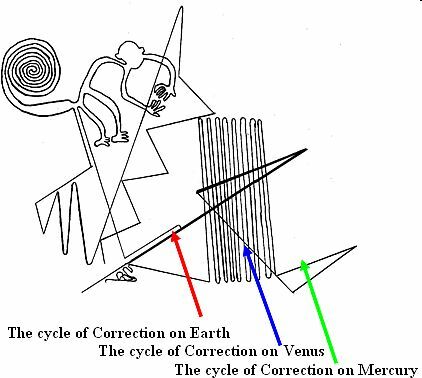 The shortest cycle of Correction specifies n the highest level of consciousness perfection of Mercury mankind, on the last planet of Solar system. Thus, in the solar system from planet to planet consciousness of humanity will be improving more and more.